The cutoff date for submitting petitions by individuals who are interested in running for office is rapidly approaching. April 19th is the cutoff date. As of today, I am aware of three candidates who have submitted their signed petitions for Supervisor. As I stated in a previous post, there are two editors for this website- myself and Jim Foulkrod. We have differences of opinion regarding who is the best candidate for the Supervisor position. However, we both agree that current Supervisor Gonser is not the best person for the position based on his actions and performance over the past 3+ years. I have put together a comparison chart that shows the qualities I would like to see in our next Supervisor. I included my perspective on each candidate in those areas. You may have other criteria & perspectives that you feel will influence your voting decision this summer. A thoughtful analysis of the candidates and your informed decision, will help make sure that happens. From my perspective, Mike Bailey is the right choice for that position! 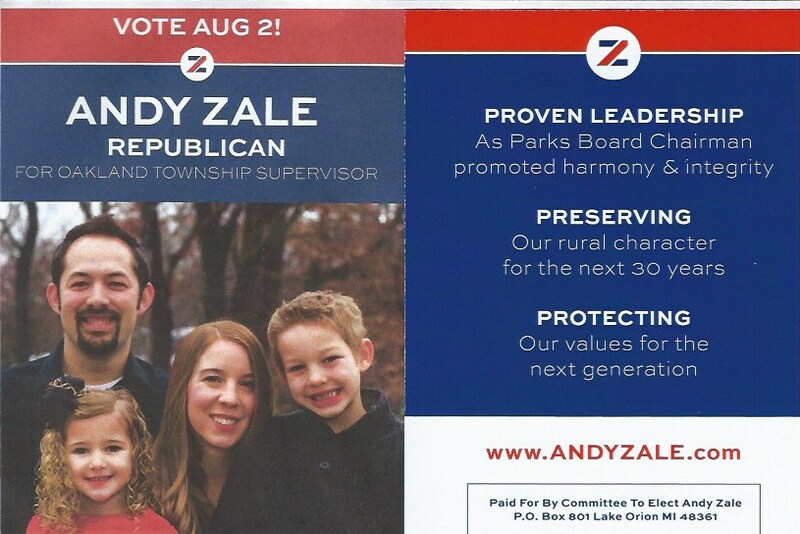 This entry was posted in Board of Trustees, Planning and Zoning, Supervisor Gonser and tagged andy zale, August 2016 Primary Election, Mike Bailey, Oakland Township Supervisor Race, Terry Gonser on April 11, 2016 by richardjmichalski. REMINDER: Meet Mike Bailey – Candidate for Supervisor – this Sunday Afternoon! 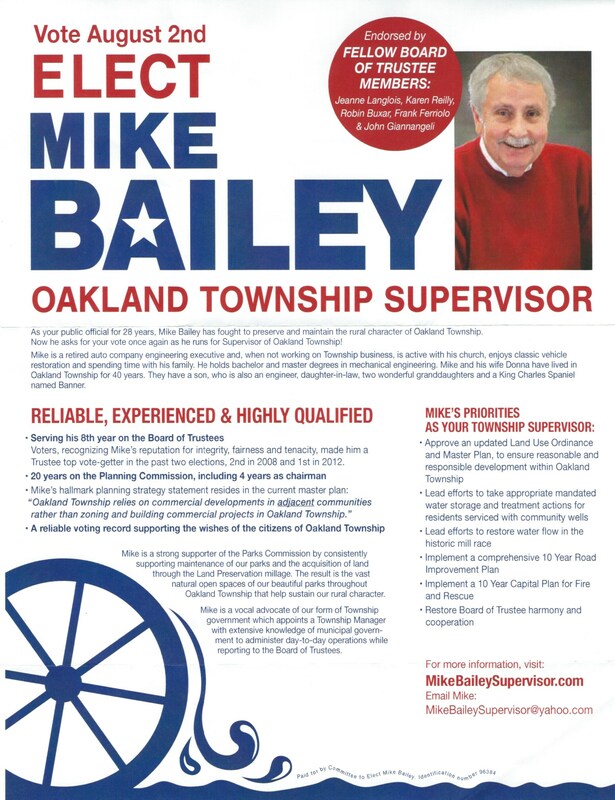 As previously reported, current Oakland Township Board Trustee, Mike Bailey, has announced his candidacy for Township Supervisor. 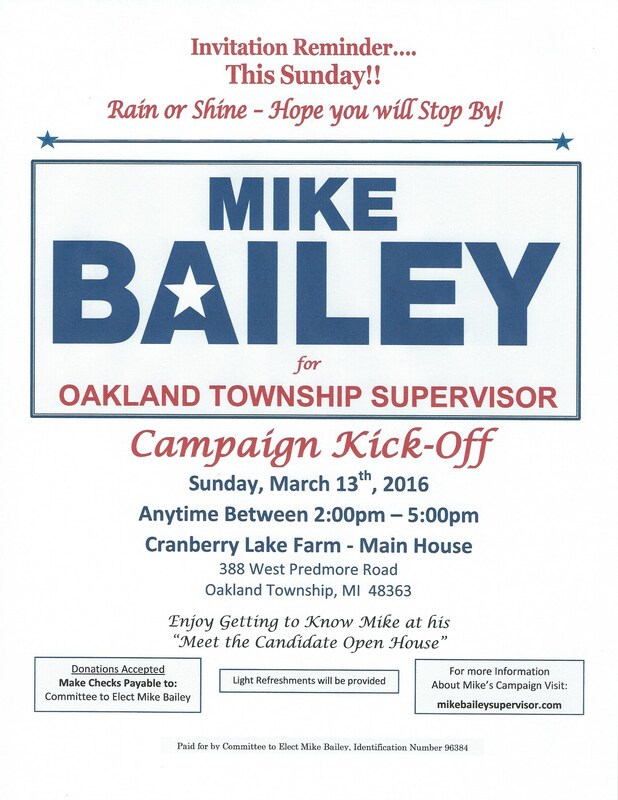 His campaign kick-off – “Meet the Candidate Open House” – is scheduled for Sunday March 13, 2016 at the Cranberry Lake Farm. Light refreshments will be provided. The informal get together will be between 2 and 5 PM. Please drop in to meet Mike and discuss any concerns you may have about our Township. If you have not had the opportunity to visit the Cranberry Lake Farm facilities, it would be a great opportunity to do so and meet Mike. Mike has decided to put his many years of experience (gained while serving our community for 28 years on various Township Commissions and Boards) to greater use by running for Township Supervisor. 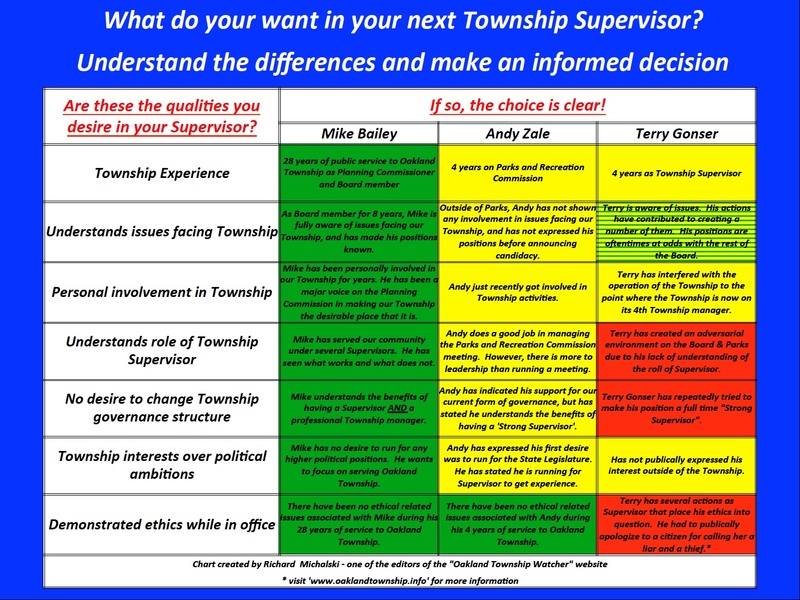 As you may know, the Township has been plagued by many issues since current Supervisor Terry Gonser was elected in 2012. Many were a result of his own actions. Many people who supported him in 2012 now acknowledge that he was not properly ‘vetted’, and they no longer support him. Supervisor Gonser’s repeated attempts to change the structure of our Township’s governance, by making himself a ‘Strong Supervisor’, was a major reason for the trauma our Township has suffered. He had no experience in our Township’s governance or understanding of its structure, yet he wanted to make himself the main decision maker on all matters that affect the Township. The other Board members finally recognized this, and have recently ‘pulled in the reigns’. Since he is running for office again, Gonser will likely continue to attempt to change our Township’s structure, resulting in ongoing conflict at the Board level, and a lack of progress on Township issues. no desire to use the Supervisor position as a jumping point for higher political positions. Neither of the other two announced candidates for Supervisor possess this collection of attributes. So please come and meet Mike on Sunday, and consider supporting him for the August election. He is an honorable person who will focus on serving the community – not looking for something that is ‘in it for himself’. If you are appalled by this behavior, and want to see a change for the good, please come out and meet Mike on Sunday, and consider giving him your support for August. This entry was posted in Board of Trustees and tagged Board of Trustees, Gonser, Mike Bailey, oakland township, Oakland Township Board on March 11, 2016 by richardjmichalski. I hope everyone voted yesterday. This is one of those years when we will have several opportunities to exercise our right to vote. Yesterday, at many voting locations in out Township, supporters for two of the three announced candidates for Township Supervisor handed out campaign literature for the upcoming Supervisor race. Supporters for Mike Bailey and Andy Zale handed out this information. Here are copies of the fliers that were being handed out. We will continue to provide upcoming election information as we receive it. This entry was posted in Board of Trustees and tagged andy zale, Mike Bailey, Oakland Township Supervisor on March 9, 2016 by richardjmichalski. 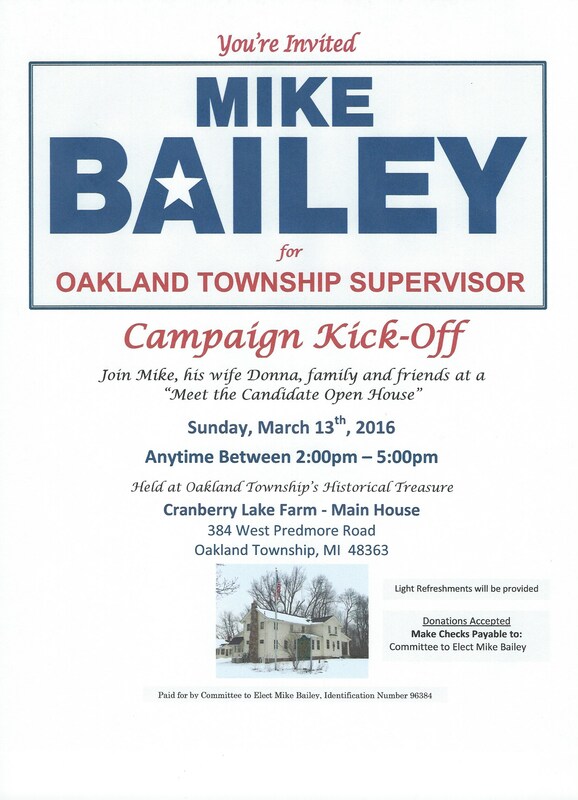 Current Oakland Township Board Trustee, Mike Bailey, has announced his candidacy for Township Supervisor. His campaign kick-off “Meet the Candidate Open House” is scheduled for Sunday March 13, 2016 at the Cranberry Lake Farm. 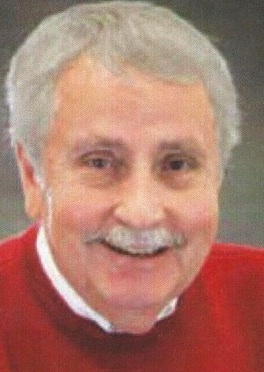 Mike has decided to try putting his many years of experience on various Township Commissions and Boards to greater use by running for Township Supervisor. This entry was posted in Board of Trustees and tagged Board of Trustees, Mike Bailey, oakland township, Oakland Township Board on March 3, 2016 by richardjmichalski. This year is a major election year. Not only will we be voting for the US President, but our Township Board and Parks and Recreation Commission positions will be on the ballot. As you may recall, the primary election will take place on August 2, 2016. The general election will be November 8, 2016. Please put these dates on your calendar. This entry was posted in Board of Trustees and tagged andy zale, Board of Trustees, oakland township, Oakland Township Board on February 29, 2016 by richardjmichalski.